Space. You want it, this delivers. 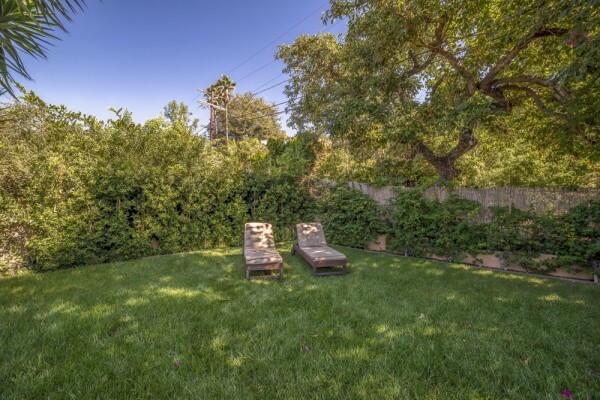 At nearly 3,500 square feet of usefully laid out interior space – outside Laughlin Park – it is hard to find in Los Feliz. 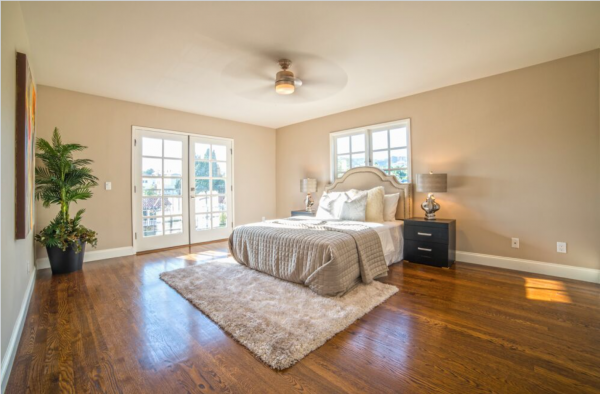 With four over-sized bedrooms, three and a half baths and additional room to spare, this Traditional 1930s home has been tastefully updated enough to more than justify its $1,679,000 asking price. 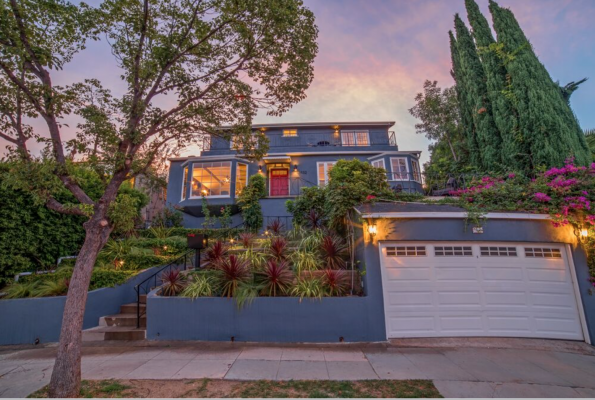 Located in Franklin Hills, surrounding Shakespeare Bridge and proximal to Los Feliz Village, you’ll find this 2-story beauty. Walking in the front door places you in the heart of any home, the kitchen. 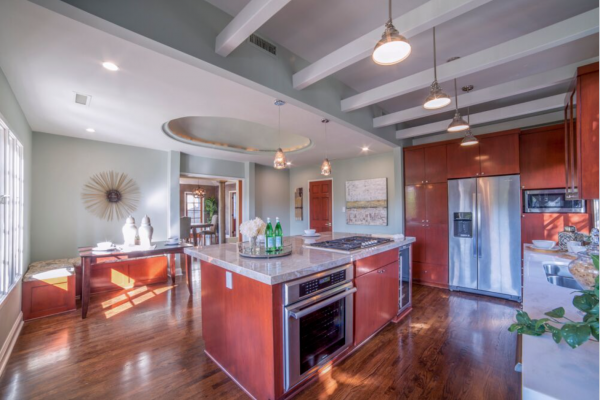 With polished quartzite countertops, stainless steel appliances including built-in wine fridge, and an assortment of custom cabinetry that includes a breakfast nook, you may just want to do all your entertaining here. 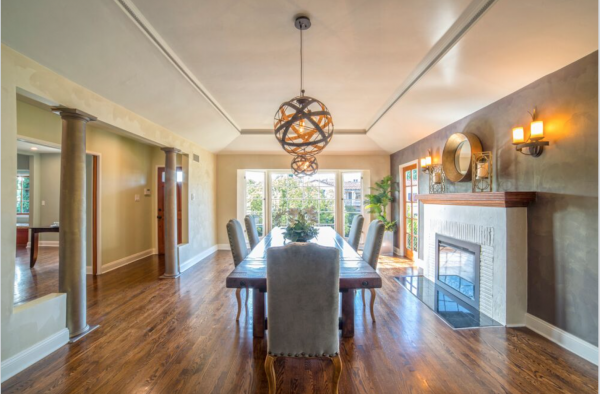 Of course, if you did decide to sit down to a formal dinner, the dining room is more than accommodating, with a fireplace that will really help set a mood. 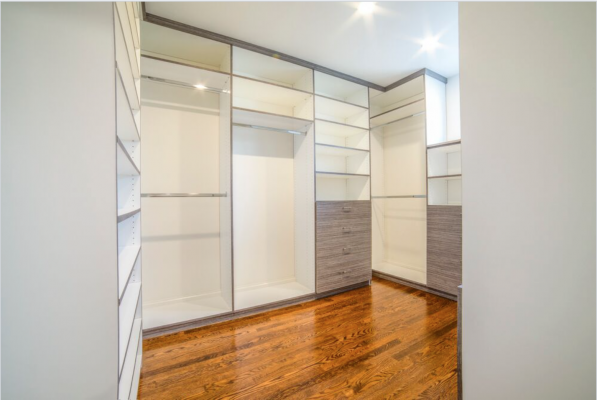 You’ll also find a well-appointed study and a more than adequately sized bed and full bath (along with a separate half) downstairs as well, which is perfect for in-laws, au pairs, or any other welcomed guests. 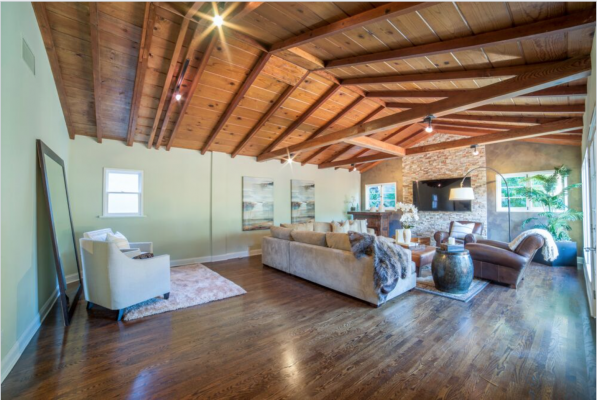 But the highlight will undoubtedly be the ginormous living room with vaulted ceilings and exposed knotty-pine beams. 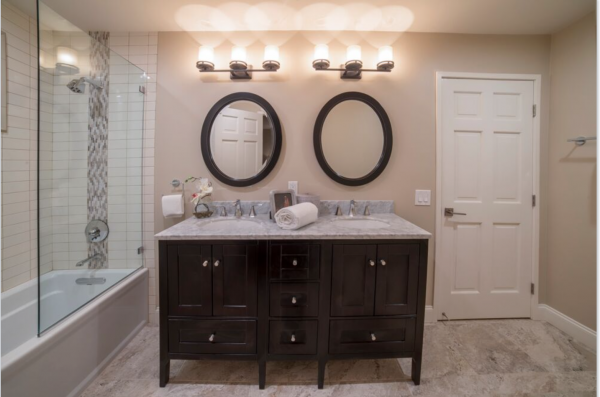 Upstairs you’ll find two large bedrooms with a Jack-and-Jill bathroom. 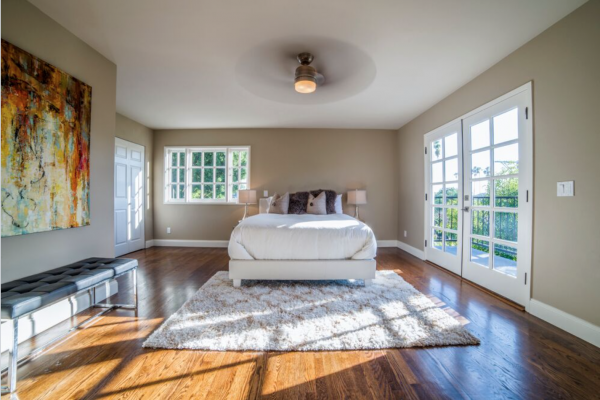 You may be surprised to discover one of these bedroom is actually larger than the master. These rooms also share a balcony that faces out to treetop views and the Griffith Park Observatory. Of course, size doesn’t mean everything. 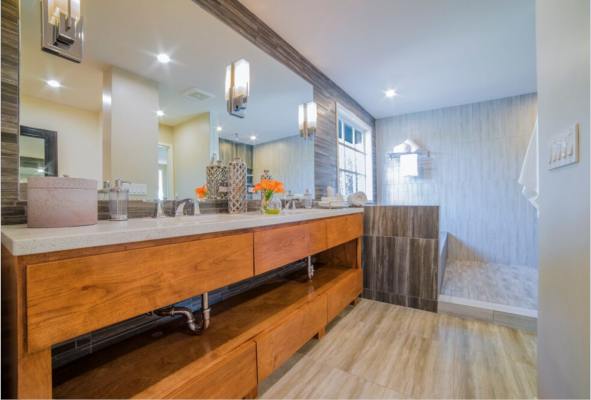 Particularly when you have a master suite fitted with built-in reading lamps, views of the grassy backyard, and a bathroom that rivals the Four Seasons (3 shower heads, a spa tub, and an ample walk-in closet). Sure it’s subjective, but there is something overwhelmingly confident about an open shower. Located on a 5,800 square foot lot, you’ll be happy to know there is still plenty of outdoor space that includes both a sizable courtyard, pre-wired for a TV, and plenty of flat, hillside greenery in the backyard. 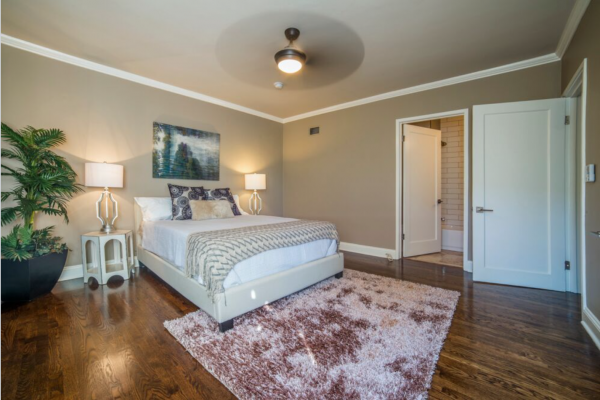 The home is included within the prestigious Franklin Avenue Elementary school district. Additional photos may be viewed here. 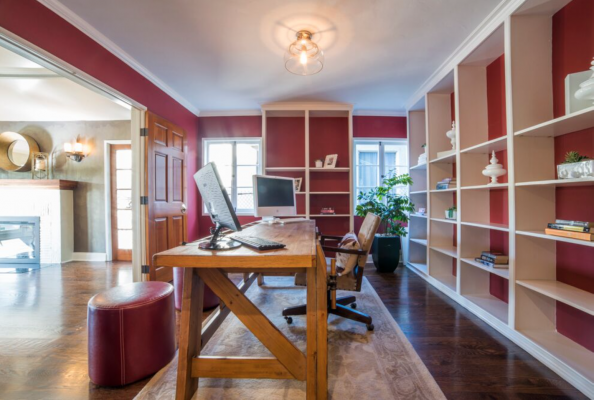 Jovelle Schaffer of Sotheby’s Los Feliz is the listing agent.